Dress your salad as never before. Try these unique gourmet dressings made fresh for us by folks we know in Georgia. 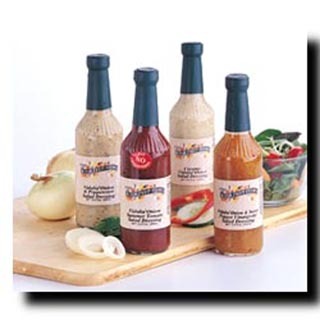 Customers have raved about these dressings for years in our store. Great for dips and marinades too. Choose your favorite flavor or let us decide. BALSAMIC BLUE CHEESE WITH WALNUTS - Creamy Balsamic vinaigrette with a luscious taste of Bleu Cheese and an added bonus of healthy walnuts. CREAMY VIDALIA ONION - A deliciously creamy, lightly seasoned dressing, made with the one and only, world famous Vidalia Sweet Onions. It's creamy, sweet and oh so delicious! A unique flavor you'll fall in love with. FLORIDA ORANGE - Florida Orange Salad Dressing is everyone's favorite at Mixon's. We like to use it as a glaze on Ham and Poultry. JUST PEACHY - This luscious Peach Vinaigrette is a delicious blend of peachy flavors perfect on your favorite fruit or garden salad. KEY LIME - Florida's famous Key Lime taste in a creamy salad dressing - A unique taste all its own! NON-FAT CREAMY VIDALIA ONION - A deliciously creamy, lightly seasoned dressing, made with the one and only, world famous Vidalia Sweet Onions, but without the fat! Go ahead and splurge, your tastebuds won't know the difference! VIDALIA ONION & PEPPERCORN - A sweet and creamy dressing made with the perfect blend of Vidalia Onions and Peppercorn. Delicious as a dip for fresh vegetables! Low cholesterol! VIDALIA ONION & SWEET PEPPER VINAIGRETTE - Chunks of Vidalia Onions and sweet red peppers make this golden vinaigrette as pleasant to the eye as to the palate. Just one look at this wonderful dressing will make you hungry. No Fat-No Cholesterol! VIDALIA ONION CREAMY CUCUMBER - What a great taste! This newcomer is a superb combination of fresh Cucumbers mixed with the delightful flavor of Sweet Vidalia Onions. It's light, creamy and so delicious. Sure to become everyone's favorite, one taste and you're hooked, we were. VIDALIA ONION HONEY MUSTARD - A delicious blend of Dijon mustard, pure honey, and a hint of Vidalia Onions. There are many honey mustards on the market, but once you try ours, you'll agree it's the best. VIDALIA ONION POPPYSEED - This slightly sweet blend of spicy flavors and poppy seed is destined to become a favorite on your table, just as it has on ours. Perfect over a citrus salad and right at home on lettuce and tomatoes. VIDALIA ONION SUMMER TOMATO - While onions and tomatoes are just about as natural a pairing as you can get, we've gone one better by using our locally grown Vidalia Sweet Onions and juicy, vine-ripened tomatoes. Blended with select spices, this dressing is a very flavorful, unique, and healthy dressing for any salad. Also use as a great marinade! No fat-No cholesterol!